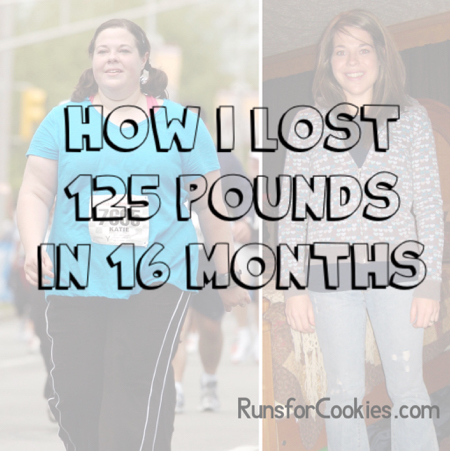 Runs for Cookies: How did you lose the weight? ETA: I've written a much more detailed post to answer this question, and you can find it here: The Habits That Helped Me Lose 125 Pounds. Ahhh, the million dollar question. Whenever people learn that I've lost a large amount of weight, the first thing they want to know is HOW I did it. So I will dedicate this post to answering that question and get it out of the way now. The short answer is: diet and exercise. Sorry to disappoint, but I did not take any magic pills or eat magic food. I did not sit on my couch all day and stuff my face with food and lose weight! Shocking, right? I actually put in a lot of hard work, dedication, and made lots of sacrifices to get where I am now--and it was all worth it. Usually this is where people stop listening, or stop reading. It's not what anyone wants to hear. However, if I still have your attention, I'll give you some details. I am a binge eater; and when I was fat, I frequently ate a lot of food in one sitting. I ate restaurant food very often (known for their huge portions); cooked heavy meals at home (again, large portions); and in order to "relax" at night, I would eat large amounts of comfort foods (namely ice cream). In August of 2009, at 253 pounds, I once again made a decision to lose the weight. I'd made the decision at least a thousand times before; but for some reason, this time I was very determined to stick it out to the end. I wanted to quit so many times, but I persevered. And in December 2010, I weighed in at 128 pounds (125 pounds lost). As far as the changes I made to my diet? I did not cut out carbs, or eat just fish and broccoli. I didn't live on salads for 16 months. In fact, I only ate maybe two salads the entire time I was losing weight, because I just wasn't a big fan of salad! I cut back on my portions by weighing and measuring my food. I counted the Weight Watchers Points in my food (I did not join WW or join their online program--I just found that counting Points easier to keep track of in my head). I used their Winning Points program (they typically change it up every couple of years, but I stuck with Winning Points). I began training to walk the half-marathon. I also made the ridiculous goal that I wanted to try to RUN a 5K race--something I thought was completely impossible. At the urging of my friend Renee (a runner), I began running three times per week (You can read about how I got started running on my Running page) and doing a long walk on the weekends to prep for both races at the same time. I walked the half-marathon in May 2010 and finished in 3:23; about 30 minutes faster than the previous two years. In October 2010, I ran my first 5K race and finished in 27:16! I was hooked on running by this point, and I kept at it. I continued to run and set my goals higher. This year, I'll be running the same half-marathon that I walked for the last three years! If there is one thing I learned on this journey, it's that there is no such thing as a quick fix. If there was, I would have found it--believe me! I tried it all. And the only thing that worked for me is to make changes that were doable for the rest of my life. I didn't give up my favorite foods, or exercise for hours every day. I just cut back on my portion sizes, started exercise when I wanted to, and the weight came off consistently! Can't wait to hear more about how you got started running!! So a guy in my class started weight watchers this summer. I guess it's totally changed now?! He said they are not just telling you that you can eat "low fat" anything. The fruits and veggies are considered "free", they want you to eat a certain amount of good fats and oils, and i guess it's more balanced now than before. I did WW in 2002/2003, so it's been quite a while. You're amazing... never discount this accomplishment! You are amazing. Thanks for sharing your journey! did you eat 1400-1600 calories throughout your whole weight loss? or did you decrease the calories at some point? I actually ate more like 1800 when I first started losing, and gradually decreased to 1400-1600. If I eat less than 1400 a day, I feel like I'm STARVING, so I don't do that. I am counting my calories and I'm at about 1500-1700 a day and have about 50 more pounds to loose and I'm at a plateau!! Its making me crazy I feel I have been doing everything right and I work with a personal trainer and not seeing any results on the scale for about a week now! any suggestions? Did you hit some plateaus as well? I think a week is a little early to consider it an actual plateau--sometimes you just might have weeks like that! I would give it another week and see what happens, and then after that maybe change it up a little (a little less calories maybe?) I would ask your personal trainer what they recommend. I am amazed!! I am 5'5 and weigh 256, I hate it!!! I gained so much weight after I had my son and it isnt going anywhere, (nor am i helping it)....what did you first do? what are your meal plans? where the hell should i start? I didn't follow a particular meal plan--I just counted calories, eating whatever I chose to eat and measuring out my portions. It can be overwhelming to start, but just make small changes that are easy to make--and they really add up over time. I get overwhelmed and give up...I have been good all week without binging and drinking more water, i guess this is a good start. Hey Katie! So I found your blog a month or so ago, and it has been such an inspiration for me! I decided to give running a try, and I love it! I just wanted to thank you for your awesome example and great advice! hello slim katie!!! answer us! So inspiring! Thank you for sharing your journey with us! As an overweight woman, it is certainly appreciated and helps provide the motivation to get off my rump and DO something about it. Keep running for those cookies, you look amazing! you are truly an inspiration! thank you!!!! there is hope. I am overweight, very overweight, and I ate 1200 calories (I tracked it and logged everything I ate) consistently for weeks and only gained more weight...but you ate more calories and lost. A person can only try for so long before this whole struggle defeats them. I am very happy for you that you found your balance, great job! You need to eat more than 1200 calories. The whole "eat as few calories as possible, create a huge deficit" thing doesn't work and usually just leaves people heavier and feeling defeated. To lose weight successfully, it's important to accept that it won't happen quickly. It will be a slow-moving process, but you need to eat enough to support your body, or else you'll just end up fatter than when you started. Try cutting 500 calories from your normal diet and go for a walk every day, and see where you are after six months of doing that. Congrats on your accomplishment! I just had one question. Why did you choose to lose 60lbs before starting an exercise program? Any particular reason? It wasn't really a conscious decision to lose 60 pounds first. I just hated exercising, and I'd always failed at past attempts. This time around, I wanted to do things differently--make small changes that I could live with forever. Eventually, I started walking in order to train to walk a half-marathon. That formed the habit, and I just kept going with it! I've picked through your blog a bit the past week reading a lot of the posts that I found appealing to me (based on title alone) and I realized I should just start from the beginning. I'm 99lbs down and two weeks away from my birthday, my one year healthiversary and my next big race (15k trail run) and I'm realizing just how terrified I am of crossing that finished line. I always seem to get depressed after a race, I love the accomplishment but then the realization of "how will I keep this up forever" seeps in. I'm hoping reading your blog will help weed through that a bit and I'll bounce back a bit quicker this time then after my half a few months ago. No one ever tells you the losing the weight part is easy, it's the keeping it off that's hard so I'm so glad that I was introduced to your blog! thank you for writing it and being so open and honest! I love your candor! It takes work, dedication and consistency and that is just the beginning to lose weight ... the RIGHT way! I started my journey again, and for the LAST time, this past March 2018. In this timeframe, I have lost almost 50 pounds and have 85 more to go. I work out 5 days a week .... consistently .... before I go to work where they have a small gym. I have seen many people start and then I never see them again. It takes getting up at 5:30 and then prepping the night before. Work clothes, workout clothes, makeup, lunch, etc. I have had a lot of people notice which is awesome but when they ask how did I do it, I'm kind of at a loss to explain because it isn't just one or two quick items to check out my list. The number one thing you have to decide above anything is that you want to be healthy! I was pre-diabetic and after working out for 2 months and eating better, I dropped 2 points and all my bloodwork came back normal! I was so excited! I have been on my Keto lifestyle and it is a lifestyle .... I'm not going back to the way I used to eat .... and I will now throwing in more detox ... a tea detox which is different than I had done before ..... https://bit.ly/2Empt3s and this is what I will be doing. When I started my journey, I started off with an Arbonne 28 Day Detox which got me going and helped me curb my appetite. However, for me, even though I work out and eat right and do intermittent fasting, the scale is not budging which is so frustrating. However, this is a lifestyle and I love to see people such as yourself that have succeeded because I need to see the finish line and know that one day I WILL reach it!